Members of the Empires of Faith project have spent the last four years thinking about how best to study religion through material culture in the first millennium AD. It’s a broad topic. In fact, it is far too big to be approached (in the first instance) as a topic in and of itself. It needs to be broken down – the terms of analysis churned over, questions posed and reassessed – before attempting to put the whole thing back together again. It is a process that has been going on since the project began, and will no doubt continue as its various members disperse across the globe from 2018. Right from the beginning, we wanted to communicate our research to as many people as possible. We’ve spent a great deal of time on books and exhibitions, but we are also directing our attention to the next generation of scholars, trying to find ways of sharing and opening up new avenues of research. 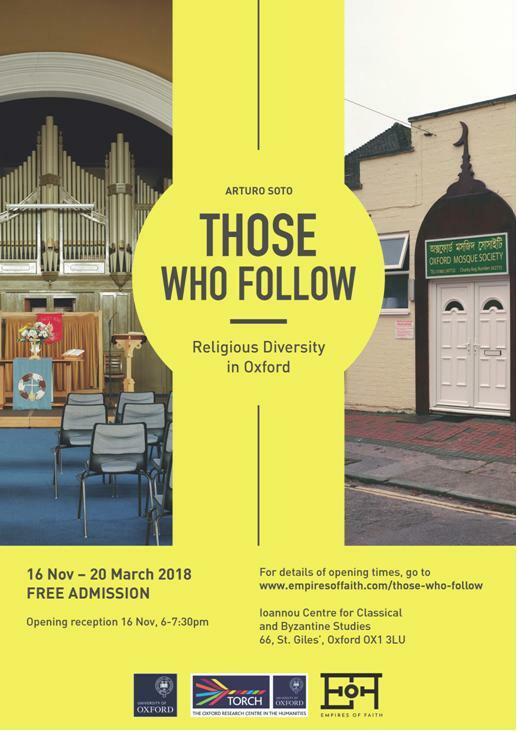 Talking Religion is one product of these efforts – an AHRC-TORCH funded doctoral research group that has engaged ten students from across a range of Oxford departments to be part of workshops and museum presentations. Amongst other things (more of which will become clear in future posts), the aim of Talking Religion is to help the students think about how to use material culture to study religion. Our objective was not simply to convey ideas. If that is the goal, then you can write them down, present them at conferences, or give papers that demonstrate your theses. These workshops have been designed not only to convey specific information, but to encourage the students to ask their own questions and discuss issues collectively. The first workshop opened with what we consider to be one of the most important principles of Empires of Faith’s work – the need for comparative discussion. This can help us to think about difficult topics, and check disciplinary and subject specific biases – it is also best conducted collaboratively, with groups of informed scholars working together. Collaborating is often easier said than done. We could perhaps have gone on some sort of team building pursuit – do people still paintball?! Needless to say we didn’t do that – this scheme would have ended before it had begun and with good reason. Instead, we opted for tried and tested introductions, reading lists, some practical discussions, and a photoshoot on a small island to get the ball rolling. Below are further details on the first workshop. In the coming weeks and months, various members of the group will provide their own responses to the process. The aim is to open up what we are doing, and perhaps to encourage other people to do the same – as such all thoughts and feedback are welcome, and please don’t hesitate to contact us if you have further questions or suggestions. We began with brief student presentations of their doctoral research – a pretty simple start. It was a good way to break the ice, make the introductions a bit more interesting, and get conversation flowing. Morgan, D. (ed.) 2010, Religion and Material Culture. The Matter of Belief. ‘Introduction’, 1-17, and ‘Materiality, Social Analysis, and the Study of Religions’, 55-74. Vasquez, M.A. 2011, More than Belief. A Materialist Theory of Religion. 211-57. These readings broadly do two things: (1) observe (directly and indirectly) some of the difficulties in studying religion through material culture, and (2) lay out possible means of overcoming these challenges. As such, we structured the day to revolve around the discussion of problems in the morning, and possible ways forward in the afternoon. There is nothing as effective as trying to use objects and images to discuss religion for showing how difficult, but also rewarding this process can be. How do we make particular objects speak to the wider study of religion without just confirming what we think we already know? What more can they tell us, and how can we allow them to affect established truths derived from textual analysis? What even is a religious object? It can surely be everything from a sacred object to a tool, or perhaps both things at the same time, so how do we deal with the variety of things that objects might convey? As useful as theory is, it’s often concrete (or, in this case, marble) examples that get to the heart of the matter. One example we took was of two well-known statues by Michelangelo, namely his David in Florence, and the Pieta, now in St. Peter’s basilica, Rome. Are these or could these ever have been considered religious objects? They are defining pieces of Renaissance sculpture and art more generally, removed by not a few viewers of any religious connotations whatsoever, functioning only as artworks. But for many in the past and for some today, they may function as religious objects, too – their subjects are biblical after all. In what sense are they religious though? Are they objects of devotion – to be venerated? Are they suitable objects of praise – to embellish a church? Do they assist with explanation – the communication of important lessons within the Christian tradition? Might they also elicit emotions and responses desired by members of the community as part of the practice of their faith? We can ask these questions in order to be able to build up a sense of what images, objects, and material culture more broadly can tell us. In future sessions, these discussions will become more pointed, but these well-known statues served as a fitting introduction. What they also allowed the group to do was to take familiar examples and be able to think back onto images and objects from their own research. Having begun the day with brief presentations of the students’ work, it was much easier to integrate these discussions of objects back to those that the students themselves work on, a process that will continue in the coming weeks. Last but not least, it’s important not to sit in a room all day. Go and talk to some ducks, or failing that some friendly pigeons by staging an obligatory photoshoot – they don’t all look happy, but I’m sure that the fresh air livened them up.